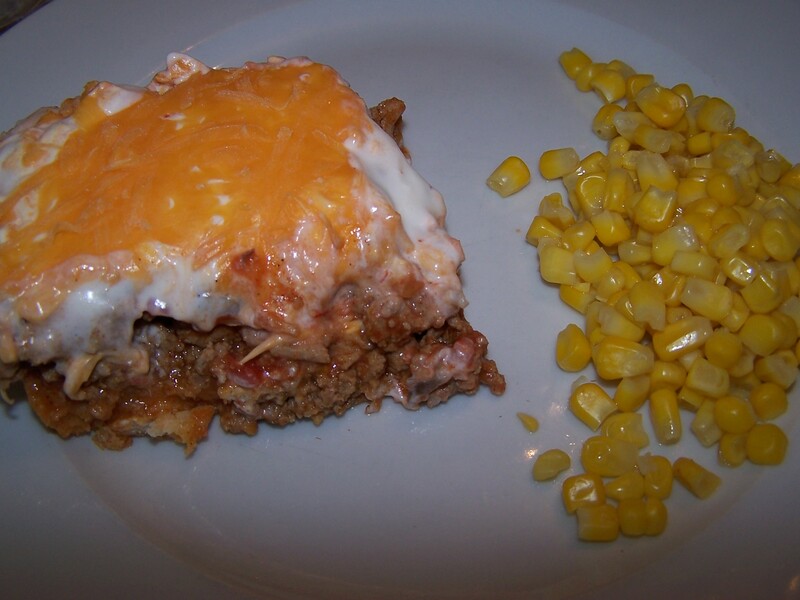 This was a great Mexican dish that we were able to make using many nonfat ingredients. My family enjoys eating Mexican foods. I make a good Taco Bake, we eat quesadillas, tacos and a yummy nacho bake. We’ve had to tone down our menu to make it more fat-free or at least low fat, but it’s easy to do with most of those items by changing just a few key ingredients. Today’s recipe is one that was sent to me by my father-in-law a couple of weeks back. The title of the email said, “Looks good.” And indeed, it did look good. I also had to cheat a bit and use salsa instead of the fresh onion, tomato and pepper, because I thought I had a pepper here and when it came time to make dinner, I did not. If I make this again I’d do the fresh veggies instead, but the salsa did work fine. Of all people, Alexandra was the kid who loved this the most. She’s by far the pickiest eater. Caroline liked all but the top and Liz liked it well enough. Don and I loved it. I even ate it leftover and it was just as good. It did make a lot, and I think the next time I’d cut it in half, and use an 11×7 dish rather than a 9×13 dish. Don even said he’d throw the corn right in the layer with the meat. It was definitely a hearty dish and a tasty one! If your family enjoys Mexican meals too, I’d recommend this! The recipe as my father-in-law sent it, is below. 3. Stir biscuit mix and water (directions on box) **our box said to use milk so I did and it was skim**to form soft dough. Pat dough on the bottom and one-half-inch up the sides of an 9 x 13 in. greased casserole dish.